A rare opportunity .... a rare destination ... that also of prime locations on this earth. 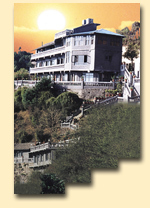 Nestled in the peak of the Nagarkot hill Hotel Country Villa will pamper you with the captivating mountains, widerness and the unspoilt landscapes and sceneries. All rooms are well furnished and spacious with pinewood paneling, shoe-racks, attached baths with 24th hours Hot/Cold running water. Country Villa proudly boasts of having the modern facilities, communication service, private verandahs, garden lounge, restaurant and bar serving delicious cuisine complemented with local and imported drinks, that is bound to soar your feeling to great heights at all times. P.O. Box No 26 Bhaktapur, Nepal.